Gelly roll gel ink pen that was invented to make writing and self expression effortless. The creamy ink and incredible array of colors provide plenty of favorite flavors for letting your thoughts flow onto paper. Handwriting is as unique as a fingerprint. Sign your name, doodle, express your artful self, or celebrate the thrills and document the spills of your life. Leave a mark that will last a lifetime. Sakura color products invented and patented gel ink and the pen casing used to create gelly roll pens. The first of its kind, these gelly roll pens created the gel ink pen category within the writing instrument industry. The gelly roll pen collection has grown to provide a wide variety of colors to support the company’s motto power to express. Black, blue, royal blue, purple, and burgundy ink colors are excellent for writing checks due to the gel ink’s resistance to fraudulent washings. Do not underestimate the extraordinary value of a handwritten note. Anyone can have fun, create art, write in scrapbooks and journals, sign documents, daydream and doodle with any of the assorted colors from the collection of gelly roll pens. Applicable for almost any permanent writing application. Journals and scrapbooks. Letters, notes and memos. Legal documents. Recipes and grocery lists. Technical qualities are archival quality ink, consistent ink flow to the last stroke, will not smear or feather when dry, waterproof and chemical proof, fade resistant, does not bleed through most papers, meets astm and acmi nontoxicity standard ap seal, not recommended for use on fabrics intended to be washed, on food service or ceramics that are washed, and not evaluated for cosmetic use on skin. Available in white color. Interested in the Sakura 37488 Gelly Roll Classic 08 (Medium Pt.) 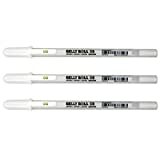 3PK Pen, White? Is the price too high? You can easily price watch this product and we'll notify you when the price reaches your target.